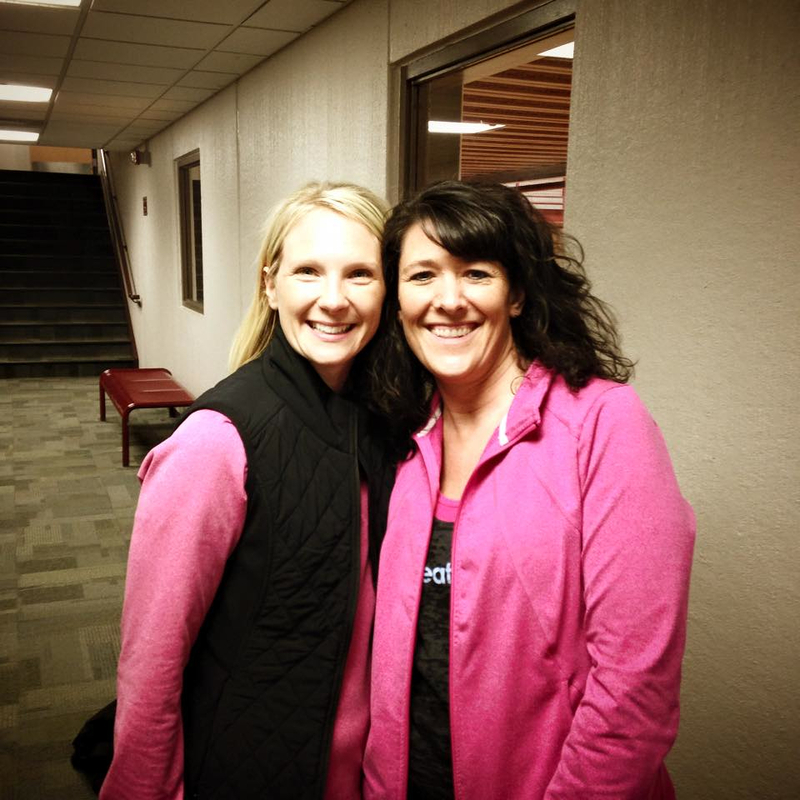 A huge thank you to my boss at Vital Fit Club, the amazing, inspiring, gorgeous and one of the most all-around genuine people you’ll ever meet, Heather Godfrey. The above picture is from the beautiful journal Heather gave me after I completed the group fitness certification course last weekend. The journal is perfect. 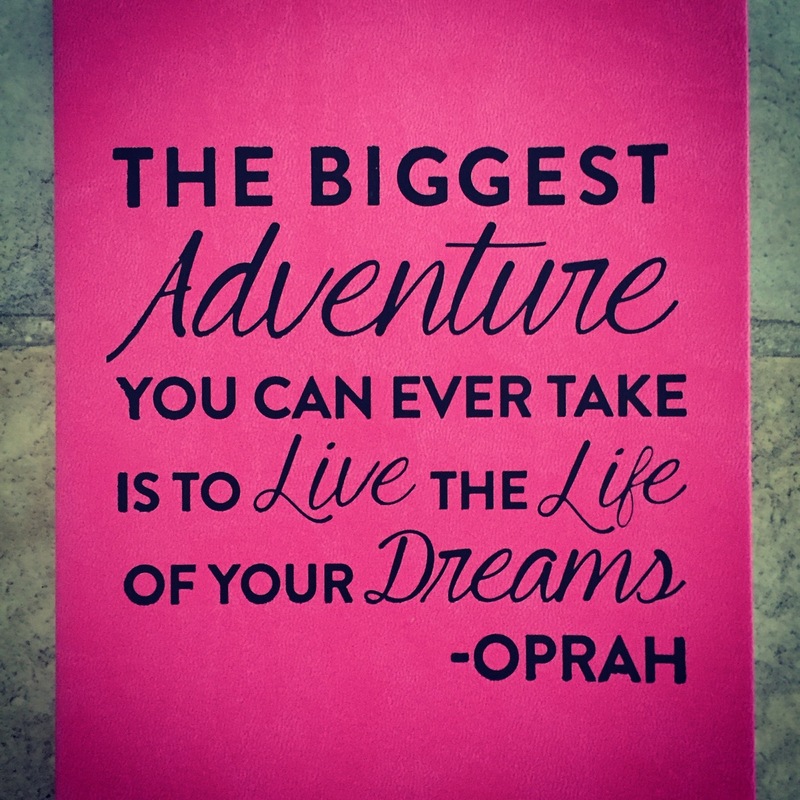 Not only is it pink, hot pink, which is one of my favorite colors, it has the most awesomest quote on it. I love this…and, it is what I am trying to do. Live the life of my dreams. So, I first have to apologize for my last blog post. I was in a bad funk. I was Miss Negative Nelly. And for those who know me, know I am usually not a Negative Nelly. Although if you were to ask my husband, he might disagree and say that I am indeed a Negative Nelly. But not all the time. For the most part, I am usually an upbeat person; a Positive Polly, if you will. It’s just sometimes, when I get stressed, I do get down in the dumps. Thank goodness it does not happen very often. Part of my stress was studying for the NETA (National Exercise Trainers Association) exam to become a group fitness instructor (group fitness is often referred to as group x, as in group EXercise). For me, there was a lot to learn and a lot of it was hard – anatomy, physiology, kinesiology, laws of physics and oh-so-much-more! Although it was interesting – or at least some of it was – most of it was just flat out confusing. But, it’s done and over with. For now. Last Saturday was the day. I got up at 4 a.m. and took off for the Twin Cities – specifically, Shakopee – around 5:30 a.m. Yes, I could have went down the night before and stayed with one of my brothers, but I opted to stay home and just get up early. For those of you who don’t know, I get up at 4 a.m. just about every day of the week because I go to work by 5 a.m. Anyway, I made it to the Shakopee Community Center around 7:45 a.m. – my class began at 8 a.m. 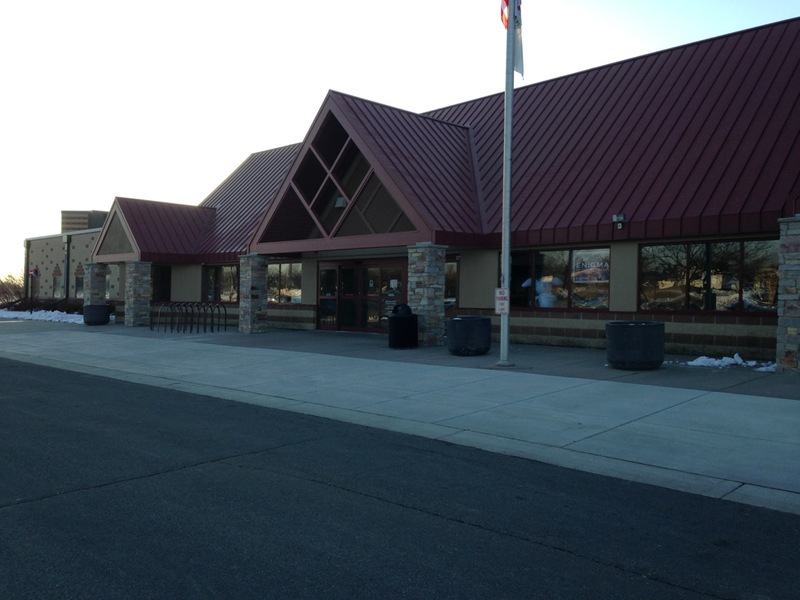 This the Shakopee Community Center and it was my home on Saturday for about eight hours. 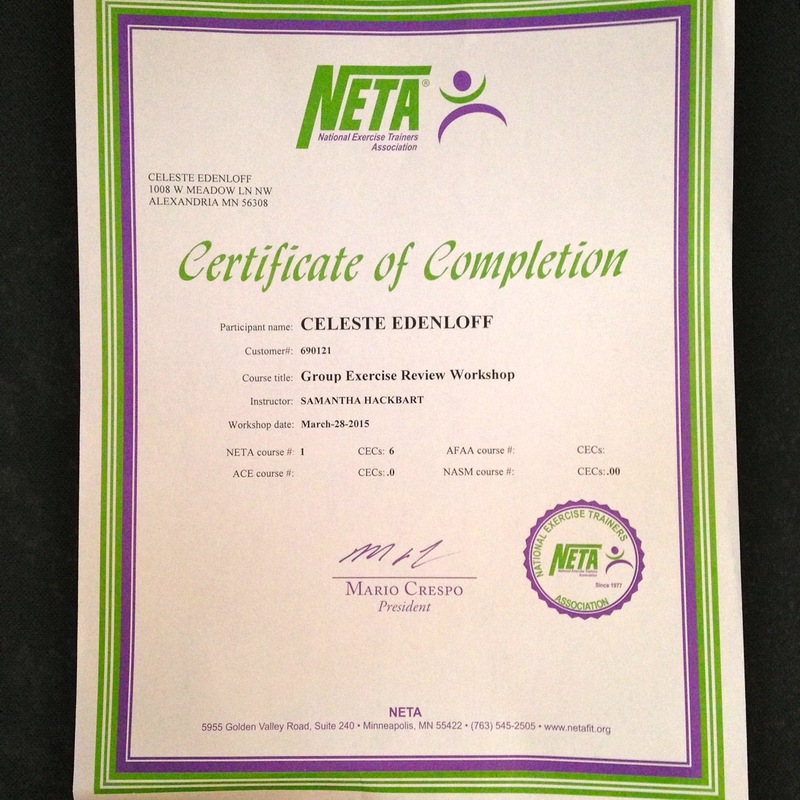 Even though I really had no idea what to expect going into the NETA class, I envisioned a little studying, a lot of hands-on instruction on how to lead a fitness class, maybe some practicing and lots of fun. Well, it didn’t go exactly like I thought. It was fun, but just not the fun I envisioned. The instructor, Samantha, was awesome. I loved her from the start. Easy-going, easy to understand, funny, genuine, nice. Great teacher/leader.There were about nine or 10 of us in the class. I felt a little sorry for Samantha because our classroom setting wasn’t ideal. And I don’t think it was what she was expecting either. Our “classroom” was set up in the “fitness studio” of the community center. It was a large gym area that was separated into two sections – a makeshift fitness studio on one side with the cardio equipment and weight room on the other. And unfortunately, the two sections were only separated by a large curtain. We could hear everything – EVERYTHING – that was going on on the other side. Made teaching somewhat difficult. Samantha had to use her outside voice numerous times! But, we made it through. 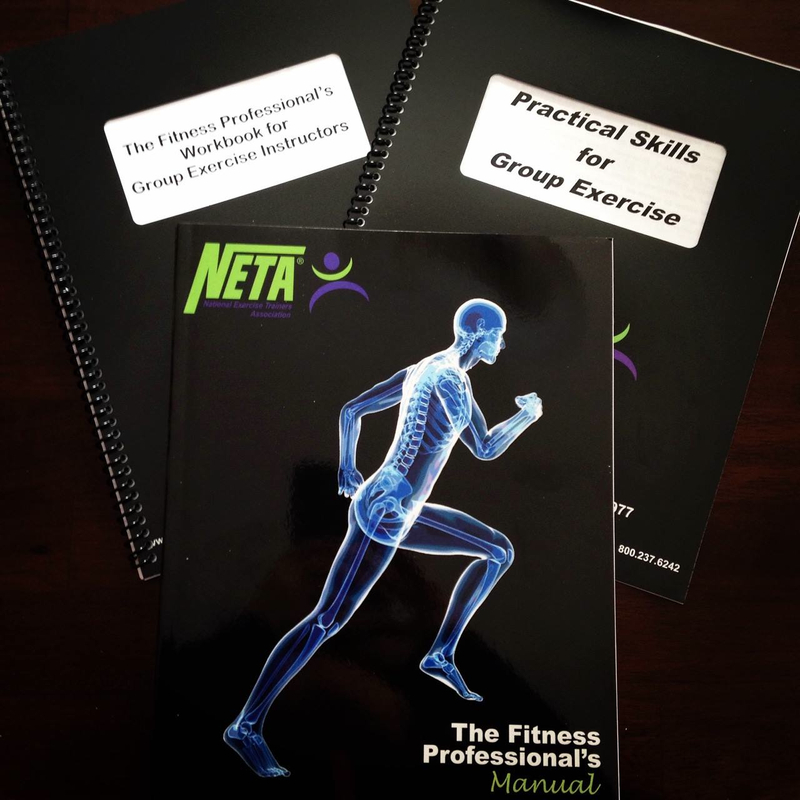 So, the majority of the day was spent going over the material in our book – NETA’s Fitness Professional Manual. The Fitness Professional’s Workbook I completed after I was done reading the “big” book and I haven’t gone through the Practical Skills book yet. You can’t tell by the picture below, but the manual was about an inch to an inch and a half thick. There were 25 chapters in the book. 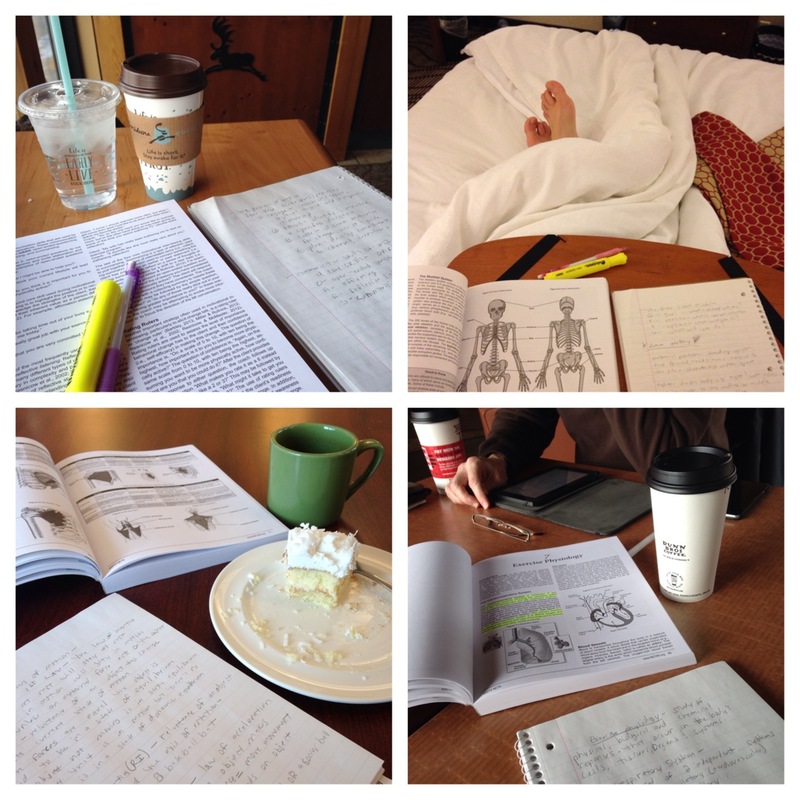 On Saturday, we basically reviewed each of the chapters went over the key points in each one. Lots and lots of reading and reviewing. I realized this was to prepare us for the test, but I have to admit, I wish there would have been more hands-on learning – as in how to teach an actual class! We took about a 45-minute lunch and it was nice to just take a break and let my mind relax a little. We were on our own for lunch and I brought my lunch, along with some snacks, with me. There were a few of them that went out for lunch. My lunch bag included the following items: an apple, a banana, an orange and grapefruit already cut up in a container, two slices of swiss cheese with about six thin slices of deli ham, a Quest chocolate chip cookie dough protein bar and a yogurt. I’m kind of a fruit girl, can you tell? 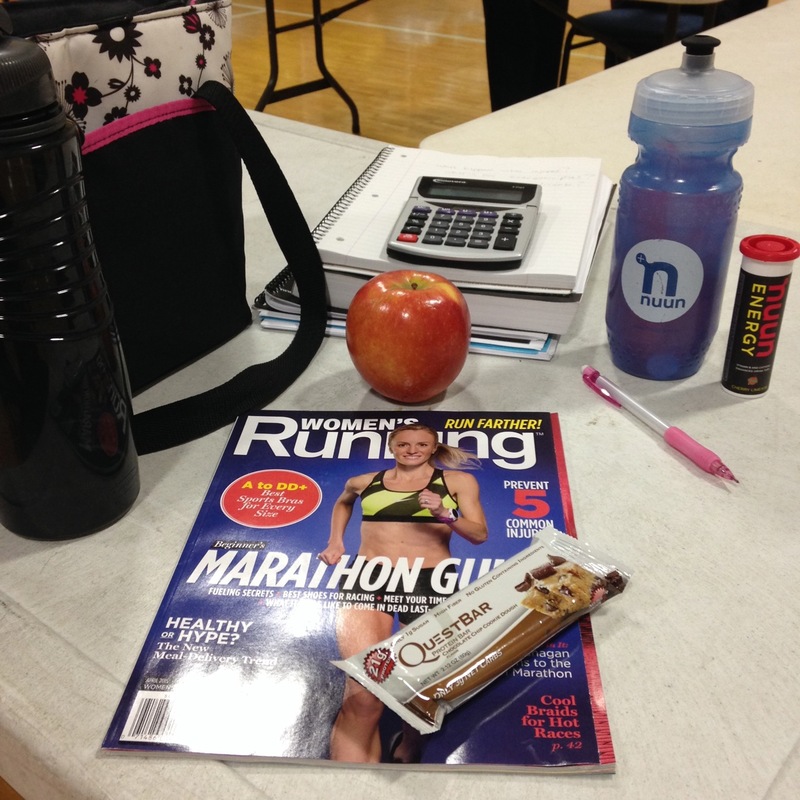 I also brought two water bottles – one with just plain water and the other with some Nuun Hydration Energy cherry limeade. I thought I might need some energy mid-to-late afternoon, especially because I was up in the wee hours of the morning. I ate everything except the banana, the apple and the yogurt. I did eat the apple, though, on the way home! I also brought along my Women’s Running magazine, but didn’t really spend anytime reading it. I spent my lunch chatting with a few other ladies that brought their lunch with them, also. After lunch, we spent a little bit more time reviewing and then we actually did go over music, as in the downbeat, upbeat, 32-count method, etc. I was kind of lost, but yet kind of not. All-in-all, we only spent about 45 minutes, maybe an hour on music and how to transition between exercises and so forth. And that was about it as far as actual teaching a group fitness class. I have to say I was a little disappointed. I really did want more on the actual teaching part. But, I am assuming Samantha had a “script” or agenda or whatever you want to call it to follow and she did her job. I do have to say that there were a few in the class that were frustrated with how the day went and I don’t blame them. I think they had different expectations, as well. Around 2 p.m., we headed to an actual classroom so that we could take the test, which was a proctored exam. This meant that our instructor had to leave the room and a third-party person, a proctor, came in to administer the exam. That process was quite formal and somewhat intimidating. The proctor also had a script to follow, which included informing us that we had two hours to complete the test, that whatever seat we were sitting in was the one we had to stay in the entire time, if we wanted to leave the room we had to raise our hand and she would come over and pick up our exam because we couldn’t leave it on the table, nor could we take it with us and finally, that we had to clear our area of everything except our test, a #2 pencil, a calculator and our beverage. Seriously, it was so serious. The test itself consisted of 120 multiple choice questions. However, 20 of the questions weren’t used in the scoring of the test. They were 20 “sample” questions that NETA was testing out sprinkled throughout the exam. We were not told which questions were the sample ones. Out of the 100 “real” questions, we had to get at least 73 right – 73% – in order to pass. The proctor explained that she would be mailing in our tests, they would be scored and then we would have our results mailed to us – in four to six weeks. Yes, FOUR TO SIX weeks. AARGH! That’s a long time to wonder if I passed the exam or not! One of the other ladies in the class, who was there for a recertification, said that it all actuality, it would probably only take a couple of weeks to get our results. Samantha, though, stuck to what she was told, which was four to six weeks. So, I guess we will just wait and see. Oh, the suspense! It’s gonna kill me. Before Samantha left so we could take our test, she handed out our certification of completion of the class. I guess that counts for something, right? It kind of makes me feel good and maybe, just maybe a little important! LOL! p.s. I am finally out of my funk I was in. Stay tuned for an update! Next Next post: Holy crap I did it!